One of the most popular types of flooring is hardwood. Hardwood flooring can be used in almost any residential or office setting, and its beauty and durability make it one of the most popular options on the market. The great thing about hardwood, is that it provides harmony throughout any home or office. Some of the most popular types of hardwood flooring are maple, cherry, beech, pine, oak, birch, pecan, walnut and hickory. In addition to the different types of hardwood, there are so many styles and finishes that can be found to suit your needs. They range from high gloss vs low gloss finishes, white flooring, charcoal tones and wide planks. While all are great choices, there are certain tendencies of hardwood flooring that are important to consider when making your selection. 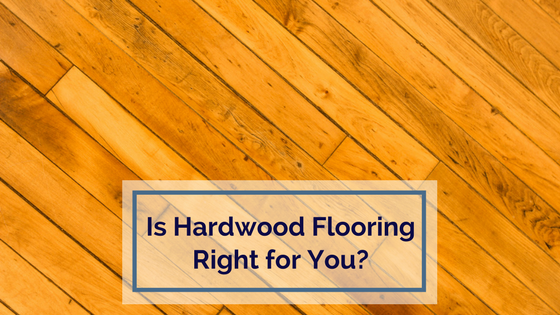 Depending on where your flooring will be installed, the hardwood's level of hardness must be noted. Walnut is considered the hardest, and even though cherry is considered one of the most beautiful, it's a little softer. The harder the wood, the more durable it is. This is determined by using the Janka hardness test, which measures the resistance of wood to denting and wear. While hardwood flooring may be more expensive initially, it provides a durable and aesthetically pleasing surface for many years. Simply clean with a damp mop or sweep regularly to preserve its lifetime and beauty. For example, when looking for a hardwood that will be installed in your kitchen, you must consider the wear and tear it will be exposed too. There are multiple challenges your floor will experience over the years. From spills and water damage, to the occasional dropping of a fork or sharp knife. By choosing the correct hardwood type for your installation, you can significantly increase the lifetime of an already durable product. If any of your family members or co-workers have allergies, hardwood flooring may be right for you. Unlike carpeting, hardwood flooring does not trap dust, dust mites, mold or pet dander. For more information on the different types of flooring and the best uses for them, reach out to one of our product specialists.